and brown. This unique gemstone is believed to foster patience and harmony with the universal energies. The bracelet features a lobster claw clasp for easy closure and it measures 8 inches long. 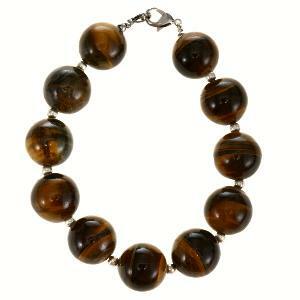 Expand your world jewelry collection with this stunning handmade tiger's eye jewelry. This beautiful creation has been entirely handmade by skilled northern Thai artisans using only the finest hand-picked stones.